As lenders tighten mortgage guidelines for Indianapolis home buyers, minimum downpayment requirements are increasing. Several years ago, you could finance a home with nothing down. Today, most conventional mortgages require at least 10 percent. 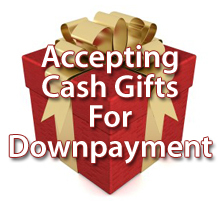 Anecdotally, guideline changes have led to an increase in the number of home buyers accepting cash gifts from family. Gifts are allowed in most cases but the problem is, if you don't accept the gift in a 'lender-friendly' way, the mortgage underwriter could reject it, and negate it. You can't just deposit a cash gift into your bank account. You have to follow a series of steps and keep records. As an additional step, home buyers receiving cash gifts should make sure that gifted funds are not commingled at the time of deposit. If the cash gift is for $10,000, therefore, the bank's deposit slip should indicate that a $10,000 deposit was made -- nothing more, nothing less. Don't add a random $100 deposit to the transaction, in other words. The $100 deposit should be a separate transaction. It's also worth noting that gifting funds between family members can create both legal and tax liabilities. If you're unsure about how donating or receiving a gift may impact you, call or email me directly. If I can't help you with your questions, I can refer you to somebody that can.